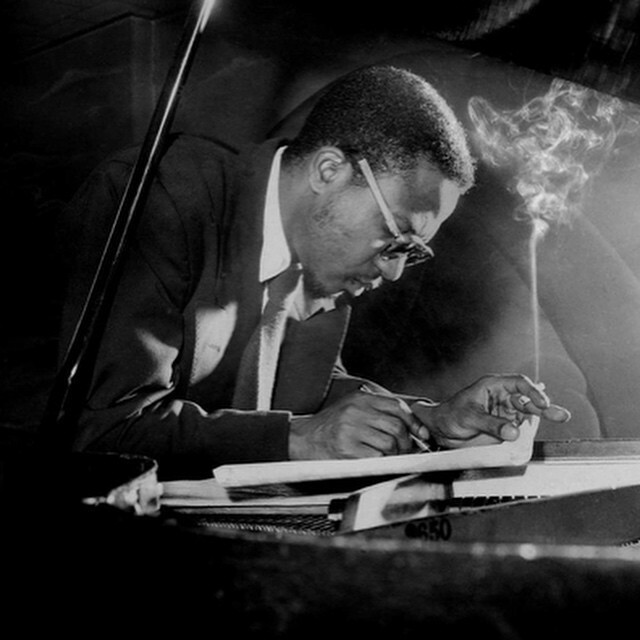 Monk made his first recordings as leader for Blue Note in 1947 (later anthologised on Genius of Modern Music, Vol. 1), which showcased his talents as a composer of original melodies for improvisation. New York in the 1950s was the crucible of new music, thinking, writing, art, and politics. Jazz, the fusion of indigenous and immigrant rhythms, was now an explosive scene. However, the life of a musician was not easy, to say the least. They didn’t always have work, therefore it’s hard to pay the bills, even to support a family. Many turned to drugs which were available at jazz clubs where money laundering and drug dealing were rife. Jazz is my adventure. I’m after new chords, new ways of syncopating, new figures, new runs. How to use notes differently. That’s it. Just using notes differently. In Thelonious Monk’s life, there’s a woman who can’t be replaced with anybody except his wife. Without her, Monk or other jazz musicians might not be established as they were/are now. Her name is Kathleen Annie Pannonica Rothschild as known as Nica. She later became a Baroness through her marriage to Jules de Koenigswarter, French ambassador to the U.S. and Canada. The two divorced in 1956. She helped supporting many American jazz musicians, arranging rehearsal space, transporting them to clubs in her Bentley. Nica was shocked by listening to Round Midnight which urged her to meet the man who made this piece. She befriended Monk during a European tour and eventually became not only his patron but his muse. Once they met, they were inseparable. Monk helped Nica to understand the music. In return, she helped him to live. The jazz scene was intimate, and most clubs were on 52nd Street. On any night it was possible to see Sarah Vaughan, Charlie Parker, Billie Holiday, Art Tatum, Monk, Dizzy Gillespie and Duke Ellington playing within yards of each other. Sony Rollins, the great saxophonist mentioned how she helped musicians back in the 70s and so forth. She was monetarily helpful to a lot who were struggling. But more than that, she was with us. By being with the Baroness, we could go places and feel like human beings. It certainly made us feel good. One of the things the two had in common is close encounters with mental illness. Monk grew up in modest circumstances in New York, whereas Nica had inhabited a gilded world in her family’s great houses in England. But his father, Thelonious Senior, like her father, Charles, behaved erratically and suffered from severe depression. Monk Senior ended up in a state mental institution, while Charles spent many months in and out of sanatoriums, then, one day in 1923, killed himself. The Baroness drove Monk long distances to gigs, took in every performance, she could and bailed him out of jail and mental hospitals. He lived with her for the last years of his life in a house her brother Victor bought for her in Weehawken, N.J., which was also occupied by more than 300 cats. Naturally, her friends called it the Catville . Apparently, cats were everywhere, on the bed, on the fridge, in the cupboards… We can see a few pictures of Monk with a Siamese cat which was, of course, one of Nica’s cats. This Siamese must have liked Monk a lot. Monk developed mental illness and often was hospitalized on several occasions which worsened in the late 1960s. He did not play the piano even though one was present in his room, and he spoke to few visitors.few visitors. Nica looked after Monk devotedly from the time they met in 1954 until his death in 1982. At his funeral Nellie, his actual wife and Nica sat side by side. They met. Monk did what he had to do, so did Nica. Both loved jazz from their existence and they lived it fully. Nothing kept Nica from helping her friends and nothing could beat Monk’s piano, either.